The 12th man or 12th player is a term for fans of teams in eleven-a-side sports games, particularly association football (soccer) or American football. As most football leagues allow a maximum of eleven players per team on the playing field at a time, referring to a team's fans as the 12th man implies that they have a potentially helpful role in the game. Infrequently, the term has referred to individuals having a notable connection to their football team. In Canadian football, 12 players are usually on the field at one time and the term 13th man is often used to refer to fans. Similarly, in Australian rules football, 18 players are on the field and the fans are often referred to as the 19th man. The term has a different meaning in cricket, referring instead to the first substitute player who fields when a member of the fielding side is injured (the term 6th man has a similar connotation in basketball). The presence of fans can have a profound impact on how the teams perform, an element in the home advantage. Namely, the home team fans would like to see their team win the game. Thus these fans will often create loud sounds or chant in hopes of distracting, demoralizing and confusing the opposing team while they have possession of the ball; or to persuade a referee to make a favorable decision. Noises are made by shouting, whistling, stomping and various other techniques. The 1922 Dixie Classic served as the setting for an event later referred to as "The story of the 12th Man." This football game featured the top-ranked Centre College and The Agricultural and Mechanical College of Texas (later known as Texas A&M). During the game, A&M coach Dana X. Bible realized that one more injury would leave him without another backfield player to send into the game. Bible called E. King Gill, a sophomore basketball player, down from the stands to stand ready as a substitute. Gill was ready in uniform on the sidelines if his team ever needed him. Gill never went in the game, but his spirit that lives on in the "12th Man." The term "12th man" is commonly used in football to refer to the fans and occasionally the manager. A notable club famous for the twelfth man reference comes from Aston Villa, referring to the Holte End stand at Villa Park. Large European and Asian teams such as Bayern Munich, Foolad, Malmö FF, Hammarby IF, Werder Bremen, Aberdeen, Rangers, Paris Saint-Germain, Lazio, Feyenoord, Ferencvárosi TC, FC Red Star, Fenerbahçe S.K., and Sporting CP have officially retired the number 12 to the fans. Stockport County fans are registered as official members of their squad with the number 12. Portsmouth F.C. has also retired its number 12 shirt, and lists the club's supporters, "Pompey Fans", as player number 12 on the squad list printed in home match programmes, while Plymouth Argyle have theirs registered to the Green Army (the nickname for their fans). Number 12 is also reserved for the fans at many other clubs, including CSKA Moscow and Zenit Saint Petersburg in Russia, Bristol Rovers and Grimsby Town in England, as well as Aarhus Gymnastikforening (AGF), Odense Boldklub, also known as OB, in Denmark, Malmö FF and Hammarby IF in Sweden and Perth Glory in Australia. On Hammarby IF's, Feyenoord and Werder Bremen's home games, the stadium speaker announces number 12 as "the fans" during team lineup announcements. Many high schools in the United States incorporate 12th Man language into their booster, supporter, or rooter clubs. Examples of such "12th Man Clubs" include the Alta Loma Braves, Dana Hills Dolphins, Washington Panthers, Richwood Knights, Diamond Bar Brahmas, Fairfield Falcons, and Brentwood Bruins. On December 12, 1992, (12/12/1992) the Buffalo Bills of the National Football League honored their 12th Man as the seventh inductee into the Buffalo Bills Wall of Fame, located inside of New Era Field. Their fans were inducted because of their loyal support during the team's early '90s Super Bowl runs. In 2008, the Bills renamed their "12th Man Walk of Fame" as "Tim Russert Plaza," in honor of the Buffalo native and lifelong fan. The team continues to refer to their fans as the "12th Man," with their independent, international fan clubs known as "Bills Backers Chapters." The Bills have a licensing agreement with Texas A&M over the use of the "12th Man" term. The Seattle Seahawks retired the number 12 jersey on December 15, 1984, in honor of their fans. In 2003, the Seahawks installed a giant flagpole in the south end zone of what is now CenturyLink Field, and began a tradition of raising a giant flag with the number 12 on it in honor of the fans, but one of whom is Sam Adkins, the former Seahawks quarterback who did wear the number 12. Usually, a local celebrity or a season ticket holder raises the flag during pregame ceremonies. In recent years, 12th Man flags have been seen all over Seattle whenever the Seahawks make the playoffs, including atop the Space Needle. In 2014, Boeing painted a Boeing 747-8 freighter with a special Seahawks livery, with the number 12 on the tail, and they later flew it over eastern Washington in a flight path spelling the number 12. When the Seahawks took the field for Super Bowl XLVIII, they were led by LB Heath Farwell carrying the team's 12th Man flag per team tradition. The Seahawks' 12th Man has twice set the Guinness World Record loudest crowd noise at a sporting event, first on September 15, 2013, registering 136.6 dB during a game against the San Francisco 49ers and again on December 2, 2013, during a Monday Night Football game against the New Orleans Saints, with a roar of 137.6 dB. As per an agreement struck between the Seahawks and Texas A&M in 2016, the Seahawks have virtually ceased from referring to their fans as the "12th Man", and instead are using the term "12s" or the 12 Fan. Football coach Jackie Sherrill created the "12th Man Kick-Off Team" in the 1980s, composed of non-athletic scholarship students who tried out for the team. Coach Sherrill has written a book entitled "No Experience Required" which details this team and the tradition. These students were placed on the roster for the sole purpose of kickoffs. The squad was nicknamed "the suicide squad". These students often had little regard for their safety and were determined to make a tackle at any cost. The 12th Man Kick-Off Team was extremely successful and eventually held opponents to one of the lowest yards-per-return average in the league during kickoffs.[when?] Later, head coach R. C. Slocum changed the team to allow only one representative of the 12th Man on the kick off team who wears uniform number 12. The player is chosen based on the level of determination and hard work shown in practices. Under Dennis Franchione, the 12th Man Kick-Off Team composed of walk-ons was brought back, though used only rarely when the team was up by quite a few points. In 1986, the Washington Redskins released a video entitled "Thanks to the 12th Man". A blogger on NFL.com considered it to be among the worst sports videos of all time. The noise of the crowd can have a significant impact on the players on the field. In American football, an extremely loud crowd can prevent the offensive linemen from hearing the snap count. This can have the effect of making the player slower to react when the ball is snapped, and his eventual response may be weaker than normal because each play is begun "with some indecision and doubt". The noise can also prevent players from hearing audibles and can make it difficult for the team's offense to coordinate plays in the huddle. The effect of the noise can often be measured in mistakes, such as false start penalties. A researcher from Harvard University discovered in a study that some football referees appeared to be impacted by crowd noise. His studies revealed that a home team acquired an additional 0.1 goal advantage for every 10,000 fans in the stadium. Delia Smith, Norwich City's joint major shareholder, received some attention when she took to the pitch during a half time interval, with a microphone in hand and Sky TV cameras in tow, to tell fans the side "need their twelfth man". "Where are you?" she cried. Norwich City lost the game in the final seconds, but Smith's passion worked to increase the affection the fans held for her. The current naturally loudest football stadium is the Turk Telecom Arena, in Turkey, host of the Galatasaray team. As a prepared attempt, the current world record for crowd noise at an athletic event was set on September 29, 2014, when the Kansas City Chiefs hosted the New England Patriots. Noise during that event reached a high of 142.2 decibels during a timeout. Texas A&M University applied on December 26, 1989, for trademark U.S. Ser. No. 74013898 related to usage of the term. The United States Patent and Trademark Office issued the "trademark registration" September 4, 1990, to Texas A&M. Four additional Trademark claims related to the "12th Man" term were also filed and granted at later dates by Texas A&M University (See U.S. Ser. Nos. 74560726, 76671314, 85977835 and 85851199), the first three of which have achieved Incontestable Status[jargon] as a result of its section 15 affidavit with the Patent and Trademark Office. According to former Texas A&M Athletic Director Bill Byrne, he contacted the Chicago Bears and Buffalo Bills about halting their "12th Man" themes. Byrne stated that, "they responded quickly with our requests to stop using our Twelfth Man trademark." Texas A&M sent requests to stop using the phrase to the Seattle Seahawks in both 2004 and 2005. The Seahawks did not respond to the requests. ^ E. A. McGowan. "The Twelfth Player". The Iowa Alumnus. University of Iowa. Alumni Association. 10 (November 1912): 30. ^ "Oddities in 1935 Sports". Reading Eagle. December 23, 1935. ^ "Twelfth Men" (PDF). Dallas Morning News (195). Dallas Morning News. December 18, 1938. ^ "HVAA Player Profile". Retrieved October 10, 2009. ^ "Rangers Dedicate No 12 Jersey to Fans". rangers.co.uk. Archived from the original on June 7, 2012. ^ Major, Andy (September 22, 2009). "Dolphins' owner: Parcells OK with glitz and celebrities". Associate Press. Retrieved February 16, 2014. ^ "Fan Club". Chicago Bears. Archived from the original on May 29, 2012. Retrieved January 4, 2013. ^ "The 12s". Seattle Seahawks. Archived from the original on December 3, 2016. Retrieved October 12, 2015. ^ "Braves Football Home Page". ^ "Page not found". Archived from the original on February 22, 2014. Retrieved February 12, 2014. ^ Mark Kiel. "High School Sports Rule". The Peorian. ^ Lonnie Schwindenhammer AND Stan Morris. "Time to open the gates for high school football". Journal Star. ^ "12th MAN CLUB". DIAMOND BAR HIGH SCHOOL FOOTBALL. Archived from the original on February 23, 2014. ^ "12th Man Club". Archived from the original on February 2, 2015. ^ "Campbellsville University Athletics News". Archived from the original on February 21, 2014. ^ "Bills Daily Charge". Buffalo Bills. December 12, 2012. Retrieved February 11, 2014. ^ "Buffalo Bills History - Wall of Fame". Buffalo Bills. Archived from the original on March 22, 2013. Retrieved February 22, 2013. ^ Major, Andy (November 6, 2013). "Russert forever remembered by Bills". Buffalo Bills. Archived from the original on February 22, 2014. Retrieved February 16, 2014. ^ Brown, Chris (November 28, 2010). "Bills calling on 12th man". Buffalo Bills. Retrieved February 11, 2014. ^ Brown, Chris (September 14, 2011). "Fitz on home field edge". Buffalo Bills. Retrieved February 11, 2014. ^ Brown, Chris (December 11, 2009). "Fan Friday 12-11". Buffalo Bills. Retrieved February 11, 2014. ^ "Bills Backers - Buffalo Bills". ^ Taylor, John (July 2, 2014). A&M up in arms over Buffalo Bills fans’ ’12th Man’ petition. CollegeFootballTalk.com. Retrieved July 2, 2014. ^ Lester, Sean (July 2, 2014). "To protect trademark, Texas A&M sends 12th Man usage complaint to double amputee, cancer survivor". Dallas News. Archived from the original on July 14, 2014. Retrieved July 7, 2014. ^ Wells, Mike (October 7, 2013). "The Colts have their own 12th Man". ESPN. Retrieved February 21, 2014. ^ Chappell, Mike (December 31, 2007). "Sanders already repaying Colts". Indianapolis Star. Retrieved February 11, 2014. ^ Gina Gallucci-White (September 5, 2009). "Damascus woman becomes 12th man for pro team". Frederick News-Post. Retrieved February 11, 2014. ^ Staci DaSilva (August 13, 2013). "Sioux City Hospice Patient & Lifelong Colts Fan Attends First Ever Game". KCAU-TV. Retrieved February 11, 2014. ^ "Dr. James Malec Honored as Colts 12th Man Fan of the Game". Wilson Kehoe Winingham. ^ "Texas A&M Aggies sue Indianapolis Colts over use of '12th Man' trademark". ESPN.com. ^ a b "Indianapolis Colts agree to stop using '12th Man' in settlement with Texas A&M". Indianapolis Star. February 18, 2016. ^ Staff. "HISTORY OF THE 12TH MAN". Seahawks.com. Archived from the original on May 28, 2013. Retrieved December 20, 2012. ^ "The 12s". Seattle Seahawks. Archived from the original on February 23, 2014. Retrieved February 17, 2014. ^ Ballard, Chris (November 6, 2013). "Into the belly of beast mode with Seattle's 12th Man". Sports Illustrated. Retrieved February 16, 2014. ^ Roberts, Chris (February 4, 2014). "Seattle Seahawks 12th Man Flag to Torment 49ers Fans". NBC Bay Area. Retrieved February 16, 2014. ^ "World's largest 12th Man flag unfurled". KIRO TV. January 30, 2014. Retrieved February 16, 2014. ^ Jordan Stead & Joshua Trujillo (January 31, 2014). "12th Man flag unfolds under Lady Liberty". Seattle PI. Retrieved February 16, 2014. ^ Mutzabaugh, Ben (January 30, 2014). "Boeing rolls out a mean-looking Seahawks 747 jumbo jet". USA TODAY. Retrieved June 2, 2014. ^ "Boeing unveils Seattle Seahawks 747 plane". Fox News. January 31, 2014. Archived from the original on February 1, 2014. Retrieved February 1, 2014. ^ COHEN, RACHEL (February 2, 2014). "SUPER BOWL WATCH: SEATTLE SOARING IN SUPER BOWL". AP. Retrieved April 1, 2014. ^ "Super Bowl XLVIII: Seahawks vs. Broncos highlights". NFL.com. ^ "Seattle Seahawks win Super Bowl in a rout on February 2, 2014". ^ Wilson, Ryan (September 16, 2013). "Seahawks fans set Guinness World Record for loudest stadium". CBS Sports. Retrieved October 13, 2014. ^ "12th Man lifts CenturyLink Field into Guinness World Record book for loudest stadium". Seahawks.com. September 15, 2013. Archived from the original on December 8, 2015. Retrieved February 23, 2016. ^ Florio, Mike (December 2, 2013). "12th Man sets new noise record". Pro Football Talk. Retrieved February 23, 2016. ^ Quinton, Sean (December 2, 2013). "Seattle's 12th Man reclaims Guinness crowd noise record". Seattle PI. Retrieved February 23, 2016. ^ Rovell, Darren. "Seahawks reach 5-years licensing deal with Texas A&M". ESPN. Retrieved August 11, 2016. ^ a b "Seahawks ink $140K deal with A&M for 12th Man". ^ Unknown. "The Twelfth Man". The Battalion. 10 (November 25, 1921). Students Association of the Agricultural and Mechanical College of Texas. p. 17. Archived from the original on January 31, 2013. ^ AP Newswire. "Texas Ag of Twelfth Man Fame Serving Uncle Sam" (PDF). Dallas Morning News (16 July 1942). Dallas Morning News. ^ a b Cook, Beano (October 8, 2006). "Ten Days That Shook the Sport". ESPN. Retrieved July 26, 2007. ^ Durham, Timothy (September 29, 2008). "12th Man honors Sherrill". The Battalion. Archived from the original on January 11, 2012. ^ "NBC Evening News". Vanderbilt Television News Archive. September 2, 1983. Archived from the original on May 27, 2009. Retrieved May 22, 2009. ^ "Twelfth Man". Aggie Traditions. Archived from the original on December 29, 2006. Retrieved December 31, 2006. ^ "McNeil sets Aggie offense record in win over SMU". KTRK-TV. Associated Press. September 17, 2005. Archived from the original on November 11, 2005. ^ Heater, Jay (December 27, 2006). "LaMantia A&M's main 12th Man". Oakl. Trib. – via HighBeam Research (subscription required). Archived from the original on May 9, 2012. ^ Barron, David (July 7, 2014). "Texas A&M purchases 12thMan.com domain for athletics". Sports Update. Houston Chronicle. Retrieved August 2, 2014. 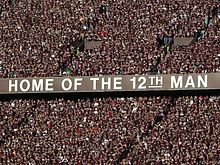 ^ "Texas A&M Secures Ownership of 12thman.com" (Press release). Texas A&M Athletics. July 7, 2014. Retrieved August 2, 2014. ^ Tinsman, Brian (February 15, 2012). "NFL.com 'Grammy' For Redskins Fan Video". Redskins.com. Washington Redskins. Retrieved October 14, 2014. ^ Rank, Adam (February 12, 2012). "And the Grammy for worst sports video ever by a team:". NFL.com. National Football League. Retrieved October 14, 2014. ^ "Bacary Sagna: Man City defender charged by FA for Instagram post". BBC Sport. January 10, 2017. Retrieved January 12, 2017. The Football Association allege that the defender's post, which was later deleted, "questioned the integrity of the match official". ^ Boling, Dave (September 21, 2006). "Artificial noise? Much ado about Hawks' 12th Man". The News Tribune. Tacoma, Washington. Archived from the original on November 17, 2007. Retrieved September 11, 2007. ^ a b c Baldinger, Brian (January 12, 2004). "Gaps in action can kill home-field edge". The Sporting News. Retrieved September 11, 2007. ^ Acee, Kevin (December 26, 2006). "They're right on Q". The San Diego Tribune. Archived from the original on December 27, 2006. Retrieved September 11, 2007. ^ "Panthers thrive in hostile environments". The Augusta Chronicle. January 21, 2006. Retrieved June 2, 2014. ^ "Study reveals referees' home bias". BBC News. May 6, 2007. Retrieved September 11, 2007. ^ "Delia Smith BBC interview". Retrieved May 11, 2006. ^ Gama, Karla Villegas. "Loudest Stadiums in World Football". ^ FUSSELL, JAMES A. (October 3, 2014). "KC Chiefs pay thousands to proclaim 'loudest stadium' record". kansascity.com. THE KANSAS CITY STAR. Retrieved October 14, 2014. ^ "Loudest crowd roar at a sports stadium". ^ "Seahawks' "12th Man" angers A&M". ESPN.com. ESPN. January 28, 2006. Retrieved June 2, 2014. ^ Moghe, Sonia (January 27, 2006). "Trademarking your territory" (PDF). Archived from the original on January 27, 2006. ^ "Texas A&M seeks restraining order over '12th man'". USA Today. January 31, 2006. ^ "'12th Man' for everyone: Seattle, A&M resolve dispute". ESPN. May 8, 2006. Retrieved July 26, 2007. ^ a b Jessop, Alicia (January 31, 2014). "Texas A&M Stands To Earn More In Upcoming 12th Man Trademark Licensing Negotiations As Seahawks' Exposure Rises". Forbes. Retrieved February 17, 2014. ^ Brandon Hamburg (January 19, 2014). ""12th Man" - Inside Texas A&M's License Agreement with the Seattle Seahawks". Good Bull Hunting. ^ Daniels, Chris (August 14, 2015). "CenturyLink Field no longer 'Home of the 12th Man'". KING 5 News. Archived from the original on August 17, 2015. Retrieved August 15, 2015. ^ Rovell, Darren (November 12, 2015). "Texas A&M says Colts ignoring calls to stop use of '12th Man'". ESPN. Retrieved November 12, 2015.